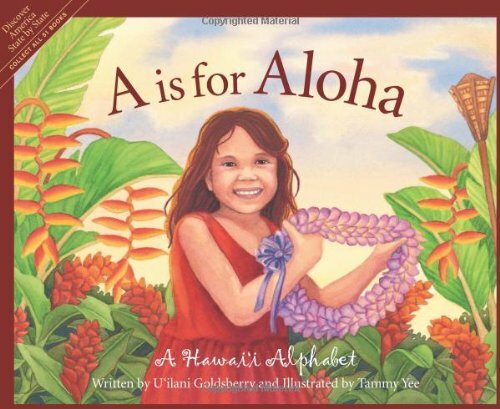 Completing Sleeping Bear Press's acclaimed Discover America State by State series is A is for Aloha: AHawaii Alphabet. The landscape of Hawaii is as exotic as its history and people. Written and illustrated by native Hawaiians, U'ilani Goldsberry and Tammy Yee, Ais for Aloha is a lovingly created introduction to one of the most-visited places on Earth. From the meaning of the word aloha to the plight of the state bird author U'ilani Goldsberry answers questions that most Malihinis have about this lush multi-island paradise. Author U'ilani Goldsberry was born on the island of Maui, in the small town of Pu'unene. She now lives in La'ie on the northeastern coast of O'ahu. She has written a variety of books including three Auntie U'i books. Illustrator Tammy Yee grew up in Honolulu, Hawaii. She currently lives in Windward O'ahu. 2006 Hawaii Center for the Book selection to represent Hawai'i at the National Book Festival in Washington, D.C.